Bay Sate Wind, which is looking to develop an offshore wind project off the southern Massachusetts coast, invites the public to meet with members of its project team at an open house. Guests will hear about the status of the project and offshore wind in the region from Ørsted staff and have a chance to discuss the environmental, economic, and technical issues, and to visit an offshore wind farm through a virtual reality experience, as well as to voice their opinion about Bay State Wind’s project. Bay State Wind, a joint venture by the Danish energy firm Ørsted and Eversource, is proposing an industrial-scale project south of Martha’s Vineyard in waters designated for offshore wind development by the Bureau of Ocean Energy Management. Bay State Wind is a proposed offshore wind project located 25 miles off the Massachusetts SouthCoast and 15 miles off the coast of Martha’s Vineyard. The project is a joint venture between Ørsted – the global leader in offshore wind – and Eversource – New England’s premier transmission builder. 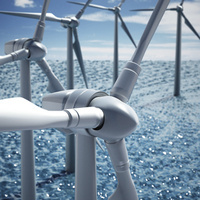 Bay State Wind’s proposed commercial-scale offshore wind project will create more than 10,000 direct and indirect jobs over the lifetime of the project, drive economic growth, provide cost-competitive clean energy and bring a supply chain that establishes the region as the U.S. hub for a new American industry.